Not everyone I know is on FaceBook. Indeed many actively avoid that social network because of all the privacy issues it presents. I myself am careful with FaceBook but I don’t hesitate to use it to update a lot of people about things that Heather and I do. And yet... this practice leaves out many people whose friendship I value. So, as you probably know, Heather and I have set out on a journey that will take us nearly a month. The main portion of it is an ocean cruise to Hawaii, but there is also some family time once the cruise is done – in California – with Rachael and her fiancé, Michael Green, and his parents. It is possible that I will write up the whole adventure once it is over – in which case, this page will disappear. But in the meantime I am posting here the simple updates that I have also posted in FaceBook. The trip is done and we’re home safe and sound. The “Updates” below give a quick blow-by-blow description of the trip as it happened, but the best way to enjoy this adventure with us is to look through the online photo album. Just click here. First leg of the trip. On board the aircraft: Winnipeg to Vancouver. Second leg. In Vancouver – through U.S. customs, and on the plane for San Francisco. Safe & sound in San Francisco. We’ll be here a couple of days. Can’t see any snow, or ice... it feels oddly warm! Someone’s walking along the street in t-shirt and shorts! Where did winter go? We will board the cruise ship this afternoon. 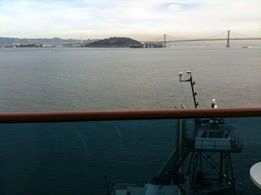 It has been a pleasant two days in San Francisco – one of the highlights of which was dinner on Sunday night with Rachael and Michael (where Werner and Mary, our cruise buddies, joined us). We were at Izakaya Kou – a fine-quality Japanese restaurant. On board the Grand Princess – us and 2,500 other people! But the view from our balcony is grand. We’re on our way! Our first full day of sailing. They say that the water under our keel is 16,000 feet deep. Ocean waves are eleven feet high. The ship is pitching and rolling, but, because it is so huge 1 its movement is quite gentle, and none of the glasses of wine spilled on our dinner table this evening. Halfway to Hawaii – trackless ocean all around. Loving it. Formal dress dinner tonight. We arrived in Honolulu this morning, after 4 days at sea. Werner and I went to Pearl Harbour, and the ladies hit the shops. We’re due to attend a luau this evening. On the island of Maui yesterday I managed to get my personal website running properly again. What a relief!! In Kawai on Monday I went for a high-speed zodiac ride along the Na Pali coast – and saw a whale up close (20 ft away! ), plus a large school of “spinner” dolphin. I saw one of the latter leap out of the water and spin several times before falling back into the waves. It reminded me of an Olympian “slope style” snowboarder! More whales yesterday! Humpbacks, tail-slapping, fin-slapping, one giant fellow breaching, and a calf ( only a couple of weeks old and as big as an SUV ) learning to spout, and dive, and breach. There are thousands of humpbacks off the coast of Maui. A wonderful day. On Hawaii’s Big Island today; off to see volcanoes! Saturday, March 1, 2014 – at sea. This will interest our Winnipeg Anglican friends: today we passed a couple in the ship’s top deck restaurant, and they looked for all the world like Ralph and Eileen Baxter. And that’s because it really was Ralph and Eileen! These long-standing friends of ours have been on this ship all this time – more than ten days – and until now we had not once bumped into them! Sunday, March 2, 2014 – at sea. The ship's Wedding Chapel was packed – standing room only (they didn’t know who would be preaching, obviously). Afterwards, Ralph Baxter said that it was “very good,” so I guess it went alright. Ralph and Eileen have now joined us in the dining room each night. We are now six Winnipeggers at our table. Our servers, Edwin from the Philippines and Julia from the Ukraine, have taken it in good grace. The ship has stopped briefly in Ensenada, Mexico. Heather, Mary, Werner and Eileen have all gone on shore, to explore, and visit a few of the shops. I don’t think that Werner will do too many shops. As for me, I’ve stayed on board, enjoying a little solitude. I think that’s what Ralph is doing too (we clergy can be dreadful introverts: we love people, but are refreshed in solitude). Our cruise ended on Wednesday – ASH Wednesday. We’ve been on the move since then. We spent 24 hours in San Francisco, touring about in an open-top bus, and attending an Ash Wednesday service. Then we drove to Sacramento, where we spent some time with Rachael and Michael, and did a lot of fine dining. Then we drove to Oakhurst, California to meet and stay a couple of days with Michael's parents. Today we toured the nearby Yosemite valley, and have had a simply wonderful time. The adventures continue. We attended the Church of Christ in Fresno this morning, with Michael’s family. It is a huge building, seating perhaps 600, and it was full to capacity. This type of church has no ordained leadership and uses no musical instrument in worship, but despite that, there was plenty of singing – hymn after hymn, all sung a capella – and a complete Holy Communion. Possibly most notable of all was this: despite the large number of members, when prayers were offered for individual needs, Michael’s mother, Phyllis, with her serious illness (now in some remission) was among the handful of people named. Clearly, the Greens are known and well respected in that enormous church. In San Francisco, on board the aircraft – beginning the long journey home. In Chicago/O’Hare airport. Saw snow from the aircraft window – covering the ground right across the Midwest... Uh-oh; haven’t seen THAT stuff for a while! Well, it’s the end of an excellent adventure. Stay tuned for the official blog – which may not be out right away as we’re going to be running pretty fast catching up on normal life. 1 The Grand Princess is 8.5% bigger than the USS Admiral Nimitz – currently the largest aircraft carrier in the world. There are cruise ships out there that are even larger (the recently built Norwegian Getaway, for example, is 44% bigger than the Admiral Nimitz!). 2 You are reading one of the pages that got wrecked. Three days later, when I was in Maui at an Internet café I discovered a workaround that can even be used on board ship. So I began updating this blog somewhat more regularly, even while in the middle of the Pacific. 3 These four brief updates were made on Hawaii’s “Big Island,” while I sat waiting in a tour bus. The bus would eventually take us to the Mauna Loa volcano, but before going there it stopped at a macadamia nut factory, where the passengers were urged to go inside and buy stuff. Heather went in dutifully, but I remained on the bus, for there was a strong cellphone signal where we were, and I was able to easily access the Internet and FaceBook with my phone. 4 Werner and Mary had returned to Winnipeg as soon as the cruise was over. We, meanwhile, had spent five more days in California before heading back.